Anyone walking past the Buzz Café and Shop during the school holidays cannot have failed to notice the new planters on display outside. This is all part of Avon Wildlife Trust’s Natural Estates programme which works with young people on housing association sites to enable them to take ownership of their outdoor spaces. This five year project will see young people living in social housing become a catalyst for significant change in the way their local green spaces are managed. Every Tuesday during the holidays a team worked with local youngsters who learned new skills that will be of benefit to the whole community that presented opportunities to enjoy and celebrate the achievement of young people. 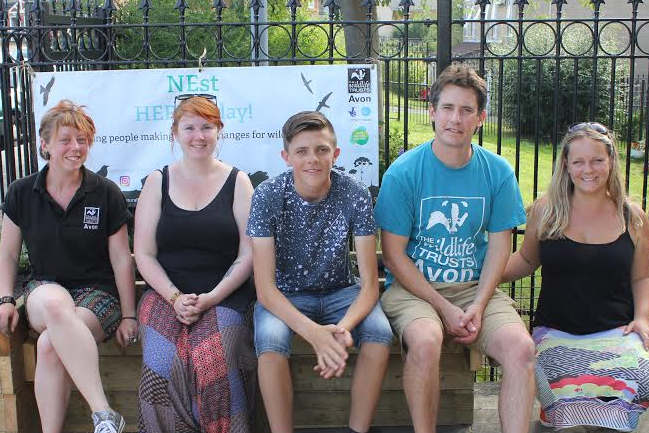 Catherine from Avon Wildlife Trust says, “Our work with Buzz Lockleaze, building herb planters with seating, is the first of many projects we will be doing with young people in the area to improve greenspaces for people and wildlife. The response from the community has been very positive and welcoming, and the work of Jack, our young volunteer, has been invaluable! We are also working with Orchard School and providing training courses and volunteering opportunities to help young people develop practical, transferable skills with routes into employment and working within their communities.